Ballpark Estimate: $140 to $180 per 1,000 square feet. Do you notice cracks and unsightly oil spots on your driveway and you want them gone? Do you have a new house and want to keep your driveway looking brand new? Do you live in an area with extreme weather and you want to protect your driveway during the harsh winter months? An inexpensive solution to deal with these problems is to have your driveway sealed. There are two options when considering sealing your driveway. You can hire a seal coating specialist or do it yourself. Driveway sealing professionals allow you to stay clean and can save you time. Sealing a driveway yourself is cheaper, but you need the proper materials, tools and time to do the task. The first thing you need to do is calculate a rough estimate of your driveway’s square footage. You can do this by measuring the length and width of your driveway. Take those two numbers and multiply them to get the square footage. For example, if your driveway is 15 feet wide by 50 feet long, you’d have a 750 square foot driveway. Do I have the right driveway? Asphalt or Concrete can be seal coated, just make sure you inform the professional or when purchasing the sealant, ensure it’s for the proper type of driveway. Is my asphalt driveway less than 6 months old? If so, you shouldn’t seal coat. It takes approximately 6 months for the asphalt to cure properly. You can’t seal coat a dirt or gravel driveway; it just won’t work! When’s the last time I had it sealed? Concrete driveways tend to last longer due to the stronger material used so they can go anywhere from 4 to 5 years between sealants. 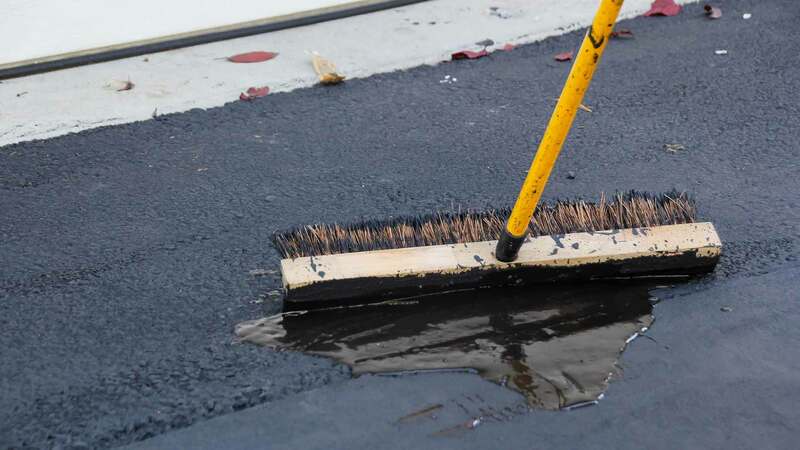 Asphalt can break down easier under harsher weather conditions so a general rule is to reseal every other year for harsh climates (a lot of sun or snow or extreme temperature variants) and every 3 for moderate ones. Do I need to repave or repair versus reseal? If your asphalt has significant cracking, large holes, giant frost heaves or chunks missing due to erosion you should look into repaving, rather than resealing. If your concrete has similar damage repairing the damage before any maintenance can be completed is essential. The price of driveway sealing will vary greatly on your location. Areas that have lots of snow in the winter and warm summers will have a greater demand for these services, thereby lowering the price. Another factor is the size of your driveway. Driveway Prep Solution (for oil spots): $8 to $15 per gallon, average of $12. Driveway Crack Filler: $7 to $25 a gallon, with an average of $12. Driveway Seal Coat: $8 to $40 per 5 gallon pail, with an average of $15. Seal Coat Squeegee or Brush: $30 to $100 depending on size and materials with an average of $50. One gallon of driveway crack filler will fill 70-150 feet of cracks. Each 5-gallon bucket of quality sealant will usually cover between 250-350 sq. ft of driveway. Professional Seal Coating: $170 on average. Do It Yourself: $140 on average. DIY includes hardware that can be reused in the future, reducing your costs on subsequent coats.